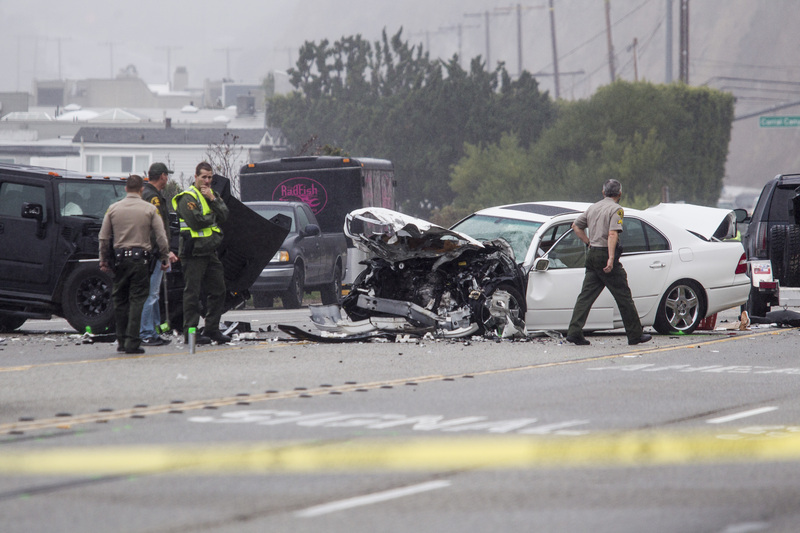 MALIBU, Calif. -- Olympic gold medalist and Kardashian family patriarch Bruce Jenner was driving one of four cars involved in a crash in Malibu that killed a woman, Los Angeles County authorities said Saturday. Jenner wasn't hurt, but seven other people suffered minor to moderate injuries in the crash that happened shortly after noon on Pacific Coast Highway, said Art Marrujo, a dispatch supervisor with the Los Angeles County Fire Department. Sheriff's Deputy Ryan Rouzan said Jenner was an occupant of one of the four vehicles. CBS Los Angeles reported that Jenner was driving one of the cars, according to a preliminary investigation. Sheriff's Sgt. Philip Brooks said Jenner cooperated with investigators, passed a field sobriety test and voluntarily submitted a blood sample to determine whether he was intoxicated. "He did not appear intoxicated or under the influence of anything at the time," Brooks said. Jenner's publicist, Alan Nierob, confirmed Jenner wasn't hurt, but he offered no additional details. The crash occurred about a mile west of Pepperdine University, on a stretch of road sandwiched between the beach and the Santa Monica Mountains. The highway in both directions was closed while investigators examined the crash site. Photos from the scene showed a white Lexus mangled in the front and back, facing a black Hummer with a heavily damaged engine and its hood popped open. A black Escalade that was pulling an off-road vehicle had a damaged front end, and a black Prius appeared to have been rear-ended. Deputies said the Lexus was one of two vehicles that stopped abruptly in front of Jenner. He rear ended the car, which pushed the vehicle into oncoming traffic where it was stuck by a Hummer. Authorities pronounced the elderly female driver of the Lexus dead at the scene. Her identity is being withheld pending family notification. Jenner was being followed by paparazzi at the time, but they did not play a factor in the crash, deputies said, adding that no one appeared to have been speeding. The accident comes at a time of widespread talk that Jenner, 65, is becoming a woman. Though Jenner himself has declined public comment, those in his inner circle have not challenged the mounting speculation that he is preparing to live as a woman and perhaps will appear in a new reality series about his transition. Jenner's appearance has gradually become more traditionally feminine, and his mother, Esther Jenner, told The Associated Press on Wednesday that she had spoken with her son about his private and public journey. Jenner won a gold medal in the men's decathlon at the 1976 Summer Games, but he is best known to a younger generation as Kim Kardashian's stepfather. He and Kris Jenner frequently appeared on the reality series "Keeping Up with the Kardashians" along with their children, and the pair's relationship and its troubles have been featured prominently on the show. The two finalized their divorce late last year, ending 23 years of marriage.